My backlight isn't working! Inverter cable seems fine, now what? OSX 10.6.8 if that helps. My macbook's backlight recently went out. Last time I had this issue(when I was on 10.5.8), it would flicker on and sometimes stay on for half an hour or so, and the mac store told me it was due to a faulty update. This time around, I was taking it apart anyway to replace a clutch hinge, and noticed there's a frayed white cable on the bottom right hand side of the top casing.... I'm pretty sure this has something to do with the screen, and seeing as how I don't have applecare anymore, I probably need to fix myself. Anyone know how? Er.... top half of the casing, as in, behind the screen. Just making sure I don't sound like I mean near the trackpad. Please give us the last three figures of your serial number so we know your exact machine. Mayer idea is right. Usually, the culprits for a bad backlight are three. Well, four, but the latter one is so rare to be utterly nonexistant. 1. A damaged inverter is the first one, and it's usually responsible for an absent, or dim backlight. 2. The second culprit is the inverter cable. You must however notice that a damaged or frayed inverter cable may look fine, but actually may be internally damaged, bent or broken. The telltale symptom is a blinking backlight, that goes on and off when you jiggle the monitor, until it's utterly trashed, and then it gives an absent backlight. 3. The third cause is a faulty CCFL lamp. A CCFL lamp is... picture it a small neon, lodged on the back of your LCD. When it's aging, it starts to give off a yellowish or pinkish hue, until the light dies. The fourth cause, negligibile and never observed by myself, is a bad capacitor near the Inverter Cable. You found a frayed white cable however. Check with mayer's guide: there's a possibility it's one of the cables soldered to the CCFL lamp that connect to the Inverter. I suggest you to try to fix the cable ASAP: I wouldn't keep a frayed cable near a hinge. 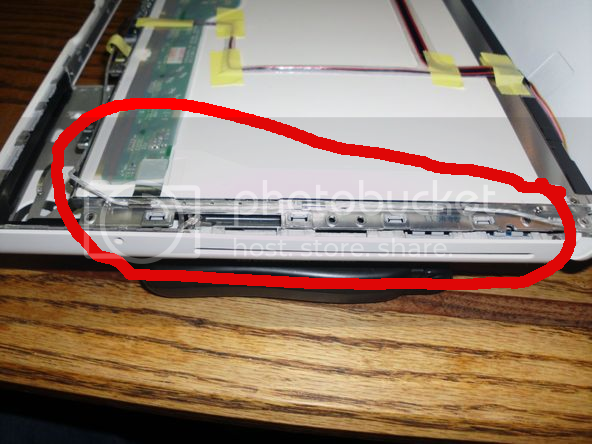 However, if it's the white cable that comes out the LCD panel, as mayer instructed you, you may have in your hands a mild case of case 3: your CCFL lamp is fine, but its connection to the Inverter is busted. I doubt you fried the CCFL lamp, but since you're at it, you may fix the cable.